Some know the Munich startup from the TV Show “The Lion’s Den” (DHDL – Die Höhle der Löwen), while others now recognize it from the chips aisle at their grocery store: myCHIPSBOX. Since 2014, founders Ebru and Erol Kaynak have built up their company with enormous enthusiasm and success. 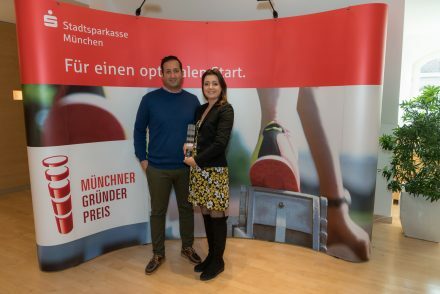 They were recently awarded the Munich Founders’ Prize. With their assortment of air-dried veggies such as carrots and red beets or bits of fruit, the startup offers an innovative range of products that will please any chip connoisseur. What’s more, all of it is organic, vegan, gluten-free and manufactured entirely without artificial flavors or flavor enhancers. We talked with founder Erol about risks, success, mistakes and of course about enjoying chips when off-duty. To put all of your energy into working on your startup idea, you both quit your jobs. Were you not worried about the risks and obstacles of entrepreneurship? Being courageous and willing to take risks is part of the game, as is fully believing in your product and the idea. We had very lucrative jobs; I was in investment banking and my wife was most recently at Nestlé. It was quite a leap to take. A major milestone was your appearance on the TV Show DHDL. How did you prepare for the pitch? We prepared quite extensively for DHDL and asked ourselves the questions: What is different about our product, and why would an investment be worthwhile for the lions? We did not watch previous episodes with other participants, because we didn’t want to drive ourselves crazy and also wanted to stay as authentic as possible. It was worth it in the end, and we were even offered two excellent deals! What happened after the show aired? You had proactively pre-manufactured massive amounts of Chipsboxes – but were you prepared for such tremendous success? We knew our appearance on DHDL would draw more attention to us than before and that it was also a huge opportunity for us. After all, millions of viewers tune into the show every week. But having such an extreme increase in demand – that is something we were not expecting. Our inventory sold out in no time. The biggest challenge we faced was purchasing raw material for manufacturing. Our products are made exclusively from raw goods from certified organic cultivation, and there is unfortunately less farmland used for it than for conventional raw goods. What is the most challenging task at the moment? One current challenge is advancing the professionalization of every division of the startup. We are also working on the further rollout of sales and on coordinating the supply chain. In your opinion, what would you say is the decisive factor for successful business development? You should fundamentally believe in your business idea, because you are going to need energy and endurance to establish your product and your company. Moreover, your business needs to be scalable. You need to have an eye both on the big picture and on each specific process and constantly think critically. That allows you to make potential adjustments to anything from the manufacturing process to sales or even customer relationship management. Your team also needs to have the relevant skills. So for us, successful and healthy business development does not depend on just one factor. As you know, people learn best from their mistakes – which mistakes have taught you the most? At the very beginning, we were very focused on e-commerce. We then quickly realized that an enormous amount of effort and money needs to be invested into scaling with an impulse product like potato chips. As a result, we quickly changed our focus to brick-and-mortar grocery stores. What advice do you give other founders? Do it only if you believe in your startup idea with all your heart, because in the beginning in particular, there will be plenty of obstacles and setbacks to challenge you. Be both courageous and flexible – particularly in the development process where it may be necessary to modify your business model. Work hard and persevere; that is the only way to attain your goals. Last but not least: beyond all the work – do not forget important things in your life like family, friends and time-off. Without all these factors, long-term success is not possible. What is it like to start a company as a married couple? myCHIPSBOX would not exist without my wife Ebru. We came up with the idea while we were grocery shopping in the chips aisle; none of the products interested us. The lists of ingredients were riddled with artificial additives, glutamate and less than impressive recipes. That is what triggered us to take a chance with our own business in the snack market. We said to ourselves: if you are going to snack, then do it right! With high-quality ingredients and appealing recipes that taste good – without any artificial additives. As a trained food engineer and ecotrophologist, Ebru has the food expertise and takes care of product development and quality management in the company. As a business school graduate, I am responsible for business development, marketing, finance and sales. So that division of labor works quite well. And how do you manage to not talk business while relaxing on the couch in the evening? We like to spend the valuable time we have outside of work with family and friends — so it is not difficult for us to talk about things other than business. 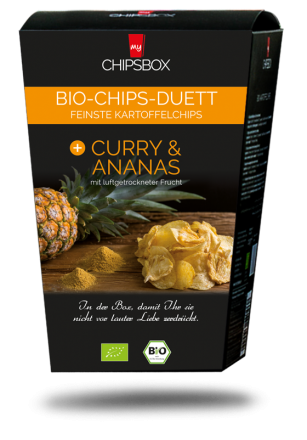 Last but not least: do you still like to eat chips at home? Of course! All of the products we offer first had to pass our personal taste test. In other words: we do not offer anything that we do not like ourselves in terms of taste. We still like eating the entire myCHIPSBOX range – they taste just as good, if not better, than the day we launched them on the market.